Enjoy WIDE OPEN, sweeping views from your balcony, living room, or bedrooms in this gorgeous waterfront home, just minutes from John’s Pass. Located in the highly desirable Crystal Island neighborhood, this exclusive piece of paradise features just one way in and out by car. 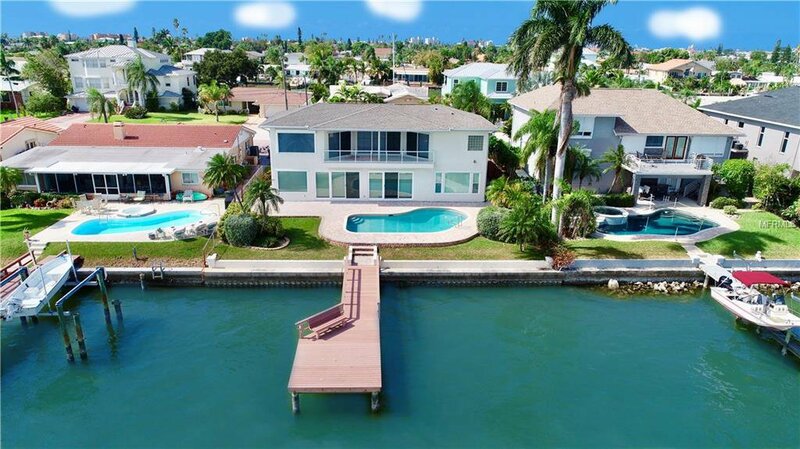 This location is simply superior, offering access to Boca Ciega Bay, the Intracoastal and Gulf of Mexico within minutes by boat. Upon entering this home, you’ll be blown away by the panoramic water view from the floor to ceiling, double-pane sliders along the entire rear wall of the home, in addition to many premium details throughout. The ultimate chef’s kitchen features a GAS COOK TOP, tiled back splash, granite counters, solid wood cabinets, a WALK IN PANTRY & premium appliances by SUB ZERO, BOSCH and DACOR. In addition to an enormous living room, there are 3 generously sized bedrooms & 2 full baths on the 1st floor. Upstairs, enjoy the ultimate MASTER SUITE, featuring his & hers WALK-IN CLOSETS, a sitting area that could also be used as an office, and a spacious master bath w/DUAL SINKS, Jacuzzi tub & bidet. Spend mornings drinking coffee & watching the dolphins from the HUGE waterfront balcony off of the master bedroom. The dock is treated composite and offers water & electric for your boating/fishing needs. Other improvements include an 18” built up wall from the seawall, plantation shutters throughout, a recently refinished pool with newer equipment, gas fireplace and so much more. Call today to schedule an exclusive showing! Listing courtesy of KELLER WILLIAMS RLTY SEMINOLE. Selling Office: COASTAL PROPERTIES GROUP.